Making physical activity evidence accessible: are these infographics the answer? The translation of complex epidemiological evidence into effective public health practise is challenging. There is an important difference between messages (in this case, the recommendations) and messaging (the effective delivery of these messages to the target audience). In January 2015, Professor Dame Sally Davies, CMO for England, asked an Expert Committee to create evidence-informed messages using rapid reviews of the evidence and expert testimony to make the physical activity recommendations simpler, for health professionals to use and for the public to understand. In consultation with the CMO office, the Expert Committee decided that the primary output should be three infographics, representing the different guidelines throughout the life course (Adult and Older adult, Children and Young People, Under 5s). A set of key criteria and a design brief were agreed for the resources, and PHE commissioned a design company to develop the infographics. The infographics were developed sequentially, by committee members specialising in physical activity within each population group. Infographic launch and dissemination by the respective CMOs in England, Scotland, Wales and Northern Ireland. Common challenges included avoiding ‘text heavy’ messages while maintaining message clarity, and finding a layout that drew attention to key messages and helped ‘guide’ readers through the information. The consultation phase was instrumental in helping prioritise and order information, while advice on marketing and infographic development was of great benefit to the Expert Committee. The Adult and Older Adult infographic (figure 1) and Children and Young People infographic (figure 2) were launched independently in the four home countries and distributed as card pull-outs in the British Medical Journal. With the support of professional bodies, the infographics have also been disseminated in electronic format to health professionals via email and the internet. The Under 5s infographic is currently in the late stages of development. Physical activity benefits for adults and older adults. Physical activity for children and young people. We welcome this first step in translating public health recommendations to healthcare professionals, but there are some remaining implementation questions. For example, is an infographic effective as a means of information dissemination in healthcare? how do we best optimise the infographic's uptake and distribution? 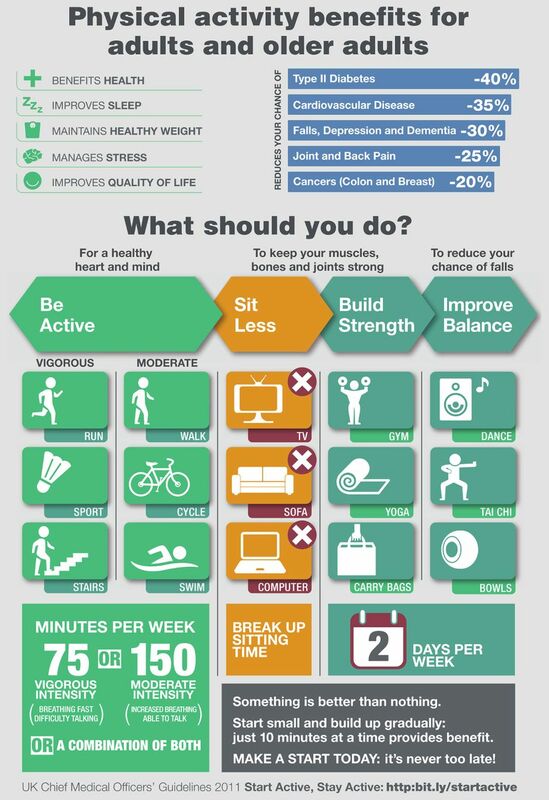 what is the ultimate impact of this infographic on clinical outcomes and physical activity behaviour? how do we best capture its clinical impact? 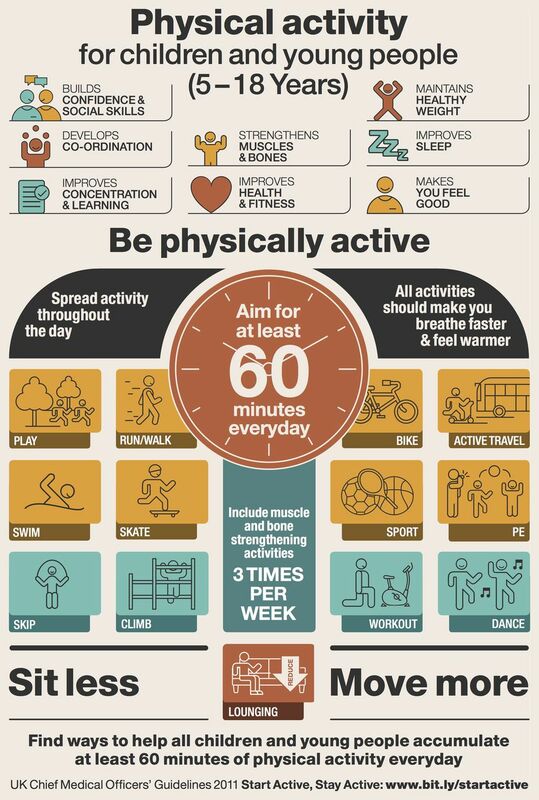 We appeal to all health professionals to share the infographics widely, display and use the resources to educate patients and encourage them to achieve the physical activity recommendations. Furthermore, we call for further implementation and evaluation research to inform the best use of these and other infographics in physical activity and healthcare in general. WHO. WHO | Global recommendations on physical activity for health. 2014. http://www.who.int/dietphysicalactivity/publications/9789241599979/en/ (accessed 4 Aug 2015). World Health Organization. Prevalence of insufficient physical activity among adults data by country. Glob. Heal. Obs. data Repos. 2016. http://www.who.int/gho/tobacco/en/index.html (accessed 12 Mar 2016). Scottish Academy. The Scottish Academy of Medical Royal Colleges and Faculties Pledge the Role of Health and Social Care in Increasing Physical Activity: A position statement by the Scottish Academy of Medical Royal Colleges and Faculties. 2015. PHE. Everybody active, every day. 2014. Collaborators On behalf of the UK CMOs' Expert Committee for Physical Activity. Contributors All authors contributed to drafting, developing and writing this editorial, which was led by HR.